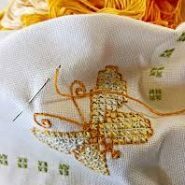 Although it"s frustrating to discover a stain on your hard-labored needlework, you can remove even stubborn stains if you know what works. Nothing is more frustrating to an embroiderer or cross stitcher than discovering that the piece they’ve labored on for months has been blemished with an ugly stain. However, with a few stain removal tricks, you can remove even stubborn stains from your needlework. As soon as you spot a stain, you need to get it out it immediately—the older the stain, the more challenging it is to remove. By washing away fresh stains with cool water, you can usually get rid of it before it does permanent damage. Blood stains—Again, if you act quickly enough, you can remove blood from you fabric by rinsing it with cool water. However, your saliva is an even better stain remover. Saturate the stain with as much saliva as you can produce until all the blood is removed. Then thoroughly wash your fabric in cold water. You can also use hydrogen peroxide. First, test it on a scrap piece of fabric. Then dab it on the bloodstain and rinse. What’s more, a mixture of table salt (about 85%) and water also works. Ink stains—Dry cleaning solvents have proven effective with ink stains. Hairspray is effective, too. However, for stubborn stains, you may want to use a dry cleaning service. Coffee and tea stains—Apply a dab of diluted shampoo (without perfumes or conditioners) to the stain, as well as liquid dish washing detergent (mixed with some white vinegar.) Then rinse well, blot and dry. Mildew—First, hand wash your fabric with detergent and bleach. Then gently rub a mixture of lemon juice and salt into the stain. Rinse with white vinegar. Be careful not to store your pieces in warm places, in the first place, as mildew thrives in humidity. If all else fails, then you don’t have much choice but to toss your fabric. However, before throwing the entire needlework away, consider how you could hide the stain. For example, if your stain is part of what could have been a blue-skied background, you could stitch over it with blue floss, using the half stitch. Or, you could also cut away the stained area. Some stitchers have made original greeting cards by using a portion of their stitched pieces. Most importantly, learn how you can keep your fabric clean, as well as prevent staining. When stitching, always see to it that your hands are clean. If traveling in a car, it’s a good idea to have baby wipes available to clean your hands regularly. And, of course, keep food and drinks away from your stitching. When you’re finished with your project, wash it in a mild detergent and then lie it out, flat, near a sunny window, to dry, on a clean white towel. (Never use a clothes dryer.) After it’s dry, you may iron it, but use care. Secure a white towel under your piece (face side up), and then cover your needlework with a second soft cloth and lightly steam iron. If you’re not ready to finish it off, make sure you store it safely in an air-tight container, so there’s less chance of mildew. Do not use Ziploc bags as plastic won’t keep out air. The more you take precautions with your work, the less you’ll have to worry about stain removal. But if you do manage to pick up a stain, take heart. You can usually remove it you know what to use and have lots of patience.